Submitted by akreider on Thu, 06/27/2013 - 22:48. I'm working on a project to create open map layers for the United States for race and income at a high resolution. I want to create a system that encourages people who have limited to zero GIS (Geographical Information Systems) experience to create maps for their community! So I've been messing around with TileMill, PostGIS, and the Census data. TileMill is an amazing program that makes it easy to make a map. They've got nice styling, great support, and you can publish it online for free (if you have limited traffic). 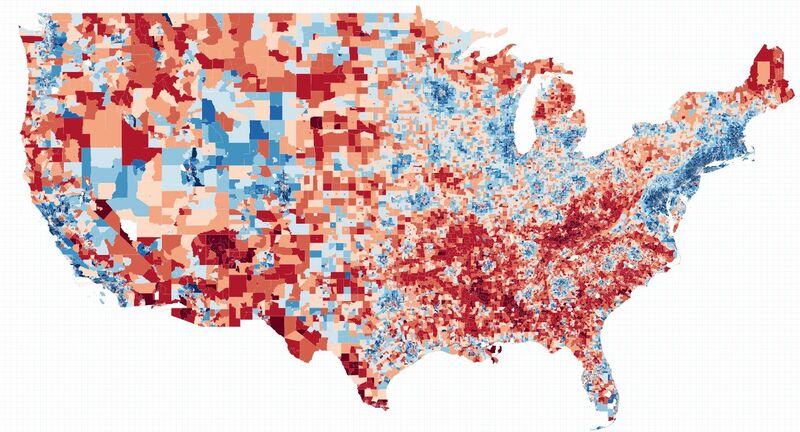 This is a map of household income in the US by census tract. There are 70,000 census tracts in the US. Legend: red is below average income, and blue is above. I divided the data into ten quartiles. I got my color scheme from ColorBrewer2.org. I chose to use a diverging color scheme to emphasize the break at the mean. So it puts emphasis on values that are just above or just below the mean. While this makes sense for national maps, I'm not sure if it is a good idea for local maps. For instance, the mean household income in Philadelphia is a lot lower than the national mean ($37,000 vs $50,000). If you are siting a dirty facility, it makes sense to use a national mean if you are looking at the entire country (ex. the Yucca Mountain nuclear waste dump) - but for other facilities it makes more sense to use a state mean, multi-county regional mean, a county-mean, or a city mean (ex. pothole repair, mass transit, street lighting). The fun part is going to be making several map layers for race for the entire United States at the block level. There are 8 million census blocks in the United States and I plan to create a couple million tiles. I like how the Northeast looks very rich, until you zoom in and look at the cities (notably Philadelphia and Baltimore). That's the danger of using maps that are weighed by area and not population.